This movie is a good example of how out of sync I am with the critical establishment (and most of the viewing public, too, for that matter). It was roundly panned, and I enjoyed the hell out of it. Yes, it’s hokey. Yes, it’s extremely predictable. I don’t care. It worked for me. That’s probably because it’s the sort of big, historical soap opera that I used to write for various book packagers. Nicole Kidman is Lady Sarah Ashley, an English noblewoman who arrives in Australia in 1939 to visit her husband’s cattle station, only to find that her husband has been murdered and the local cattle baron had his greedy eye on the station. Her only ally is the mysterious Drover (Hugh Jackman), who helps her save the ranch . . . I mean the cattle station. Nah, hell, I mean the ranch, because the first half of this movie is pure Western. It’s the John Wayne/Maureen O’Hara movie that the Duke and Maureen never made. I’m sure James Edward Grant could have come up with some reason for an American cowboy to be in Australia. I knew everything that was going to happen, right down to the way many of the scenes were staged. The only real difference is that there’s a little Aboriginal mysticism thrown in. 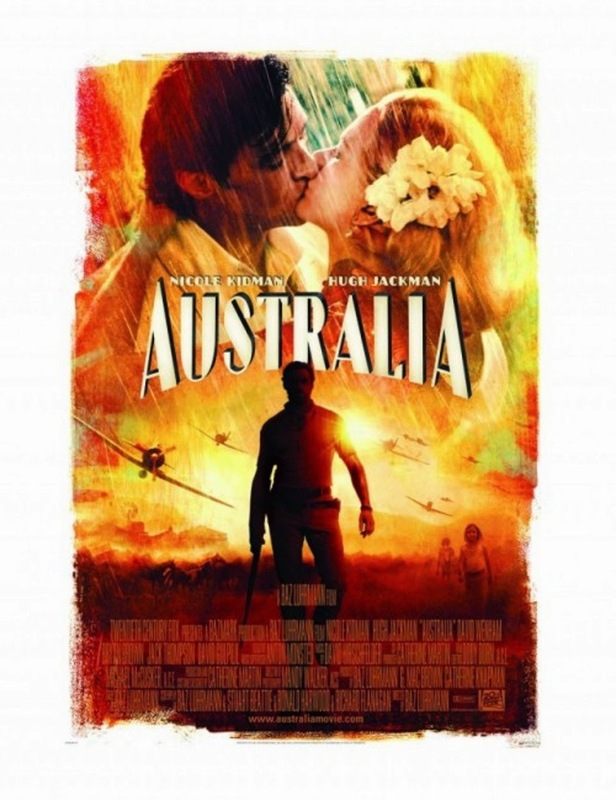 The second half of the movie turns into a World War II epic, as the Japanese attack northern Australia, but that’s all right with me because I like World War II movies, too. It’s slightly less predictable than the Western half, but only slightly. Stuff blows up. Heartstrings are tugged. Bad guys get their comeuppance. What’s not to like? Some critics even blasted the look of the film. The colors are too bright, they said. Well, why wouldn’t they be bright? This is a Fifties Technicolor movie, a big, sweeping, melodramatic potboiler. Why criticize a movie for being exactly what it sets out to be? I’m not saying that AUSTRALIA is a great film, but it’s nearly three hours long and I was wide awake the whole time. Take that for what it’s worth. AUSTRALIA is as old-fashioned as a movie can get, and sometimes that’s just what I want. What's wrong with bright colors? I don't like the washed-out and sometimes muddy colors of a lot of current movies. My old eyes can't tell what's going on half the time. Maybe the movies are filmed that way because a lot of the time nothing interesting is going on. And stay off your lawn, eh Bill? I'm pretty tired of movies that are dreary in their look as well as their subject matter, too. I liked this one a lot, too, and I was really surprised I did after hearing what the critics had to say about it. A great, old-fashioned soap opera-ish western/war romp like the kind they made back in the 50's and 60's with the Duke or Jimmy Stewart or Henry Fonda..and Claudia Cardinale. (Wouldn't she have been great in it? But then Claudia would have been great in everything...) What's not to like about a movie like this?! We have watched this movie several times, really like it. It came out just a few months after we visited Australia which made it a must watch for us. Nicole Kidmann panned her own acting in the movie, I think many took her word for it that it was not good. I can't think of a single Baz Luhrmann movie that I enjoyed, and my threshold is pretty low. Bloated and pretentious.